Learn more about Battenburg (Unknown) at Snackabase.com! This cake was born when I decided something special was needed for an event with a somewhat patriotic theme. The idea just hit me and it had to be realised, even though I had never even made a conventional Battenberg before. With a bit of luck and a lot of patience, the Britainberg was born! Ingredients wise I pretty much followed the first Battenberg recipe I found online, although probably best to make sure you use one which incorporates ground almonds to make it hold together when you cut it down into eight triangular beams. 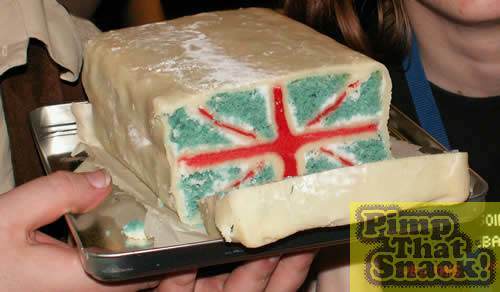 Be advised that you will need about three times the marzipan mentioned because of all the white stripes in the flag. To maintain colouration, I used water icing (a lot of icing sugar and a little water) in place of apricot jam to combine the layers. I don't know how adhesive apricot jam is but the water icing stuck like glue and may in fact be necessary to ensure structural integrity upon cutting! On top the normal ingredients you'll need a plentiful supply of red icing, I used two entire (pre-bought) tubes, and blue food colouring! For the most part it's fairly common ingredients, I'd be surprised if it cost me much north of a fiver. 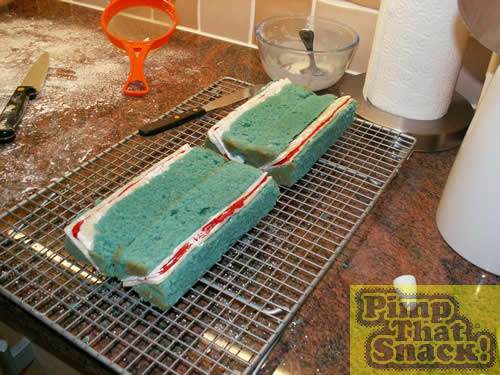 The initial baking is a little easier than a regular Battenberg since you don't need to split the mixture in two - it's all going to end up blue! 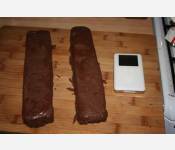 It was done in a 17 x 17 cm tin and cut into four columns fairly soon after it cooled enough to remove from the tin. If you don't have a 17 x 17 tin do plan your course of action carefully because you need each quarter to be a rectangle rather than a square. The real moment of truth is cutting the rectangles in half corner to corner down the entire length, but with ground almond the cake should be solid enough to take it. 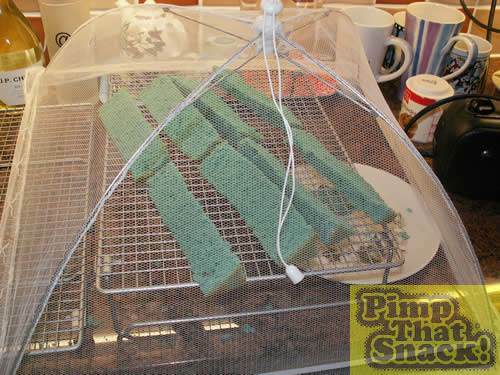 Once it's cut down into eight pieces allow it to cool fully before you rebuild it. 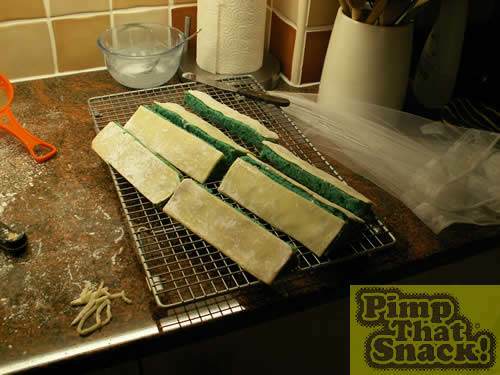 In order to get an approximate size for the diagonal marzipan strips I cut some greaseproof to the size of the cake and used it as a template to make eight thin strips, one to go on top of each diagonal. The strips were cemented in place with a generous dollop of water icing and I was reassured to find that each piece instantly became twice as stable when paired with a marzipan backbone. The plan had been to go as precise as possible (the 1:2:3 ratio of the diagonal stripes) but I gave up on that, being confident people would recognise what it was and forgive a little artistic license! Having designated which pieces would be tops and bottoms of each level I gave the bottom layers a double layer of red icing before putting the top layers in place and leaving it all to set, making another greasproof paper stencil to figure out how large the inner white stripes would need to be. Rolling them thicker that the diagonals seemed right, but exhausted my first lot of marzipan so I had to go get some more. 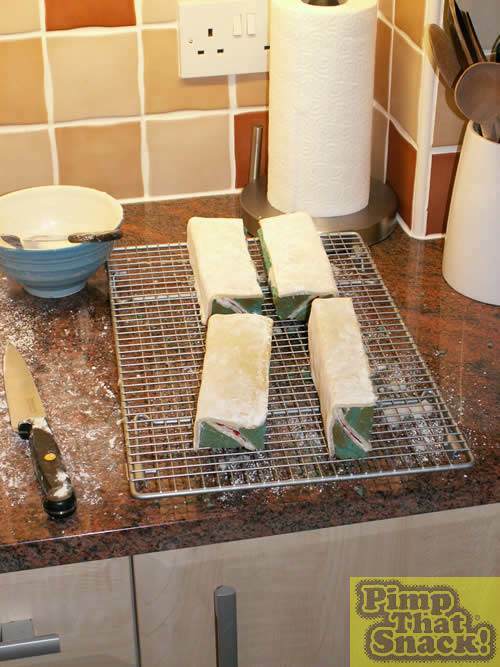 Figuring the first lot of icing would have set in that time I applied an even bigger dollop of water icing to two outer faces of each rectangle and applied the inner stripe of marzipan, giving it a bit of a pinch to get a nice sharp corner. Obviously it's incredibly important to make sure you get the inner stripe on the right two faces - the right angle corner in the marzipan should have one end of the diagonal intersecting it. After giving the water icing time to set I attached the two bottom sections to one another with a sextruple layer of red icing, wedging it in between cartons of orange and apple juice to hold it steady! When it had set I attached the two top layers together, making sure the red icing layer was the same thickness so the two would marry up. When THAT dried it was just a matter of painfully squeezing out all of the remaining red icing onto the top of the bottom layer with my aching fingers and plonking the top layer on top (again, make sure it's the right way up!). I could have got away with the first lot of marzipan if I'd left it at that, but I wanted to enclose it like a traditional Battenberg, if only to get the reaction at the reveal when the first slice was taken. So I rolled the second lot out into one big sheet, coated it all with water icing galore and folded the cake in it, pinching the edges together to seal. And that was that! The cutting inspired onlookers into a (hummed) rendition of the national anthem! And even better, it didn't crumble into pieces as I had half expected.